If you’ve perused through recent magazines, blogs, and catalogs, you’ve noticed one of the latest trends is blue and gold. While this may appear as a trend, we like to think of it as one of the most timeless colors—blue—pairing up with the most classic of all metallics—gold. While blue evokes peaceful, calm vibes, the gold adds richness and vibrancy to warm it up. Combining these hues in your home creates a look that will endure for years—no matter what your home décor style. The damask fabric and the shape of the chair say traditional, but the golden hue of the covering and the geometric pillow make an updated statement. 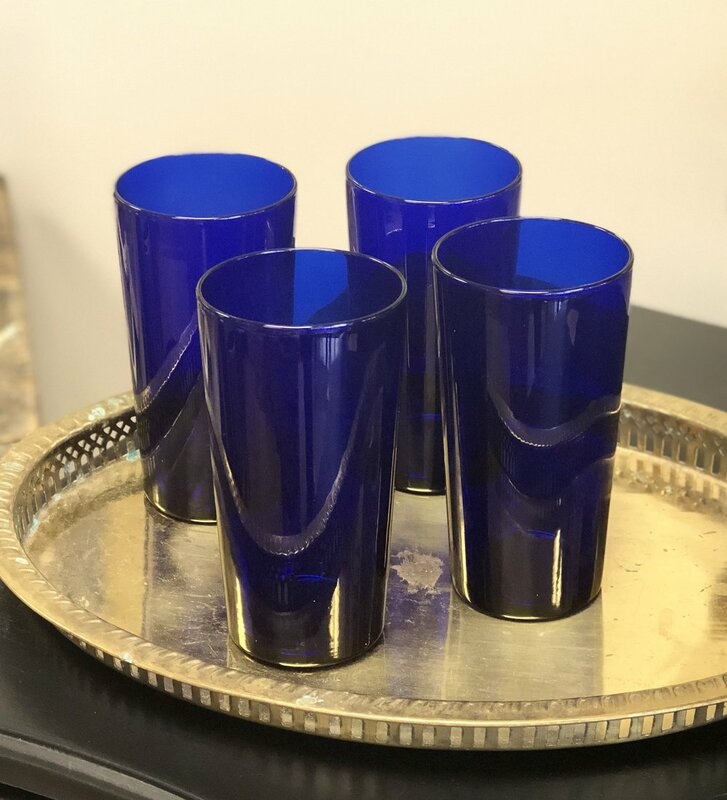 There’s nothing more classic than cobalt high ball glasses on a brass tray. The juxtaposition of the feminine curve on the back of this chair with the masculinity of the plaid fabric bring an overall balance to this classic piece. 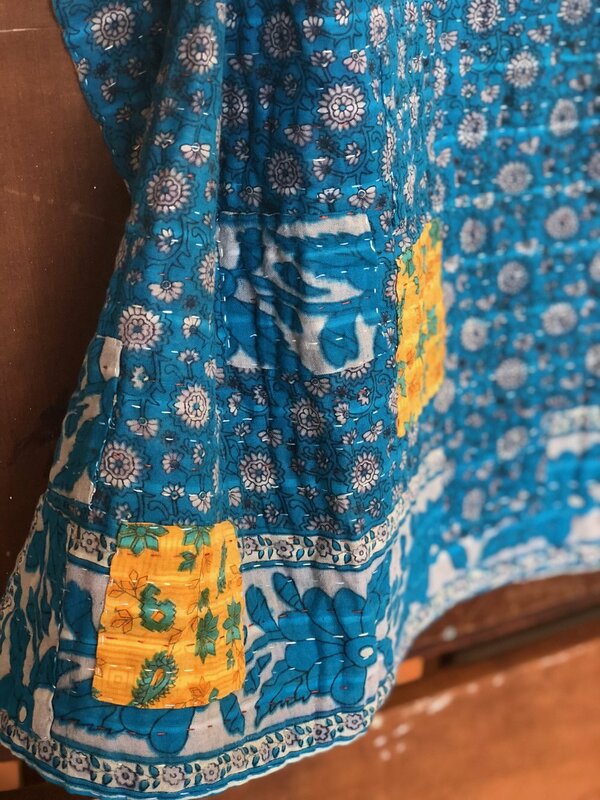 The vivid blues with accents of gold in this throw create a bold statement draped on an arm chair or hung on the wall as a piece of art. 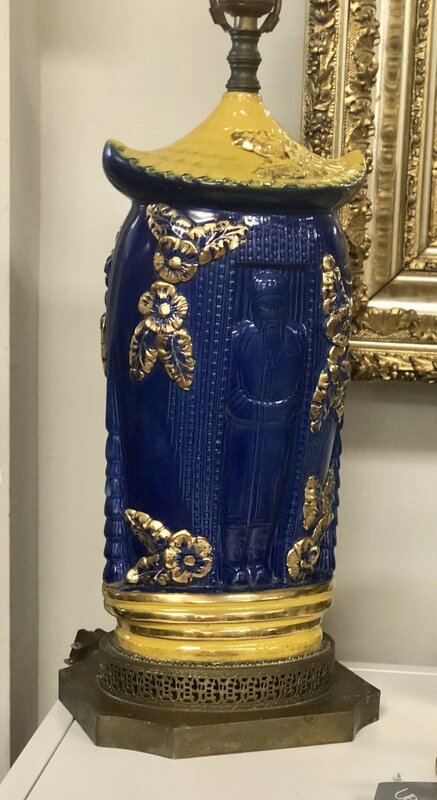 Pairing this gilded owl with a navy tone offers whimsical wisdom in your home. Handmade dishes in vivid azure add interest and conversation to your table. Clean and simple lines of the buffet are sophisticated when paired with midnight and gold. Imagine the candlelit dinner with this modern, pencil thin brass candlesticks glimmering with blue toned toppers. Combine this brilliant lamp with azure accessories for a striking statement. Chinoiserie 101— a brass bowl piled high with floral blue and white embellishments. 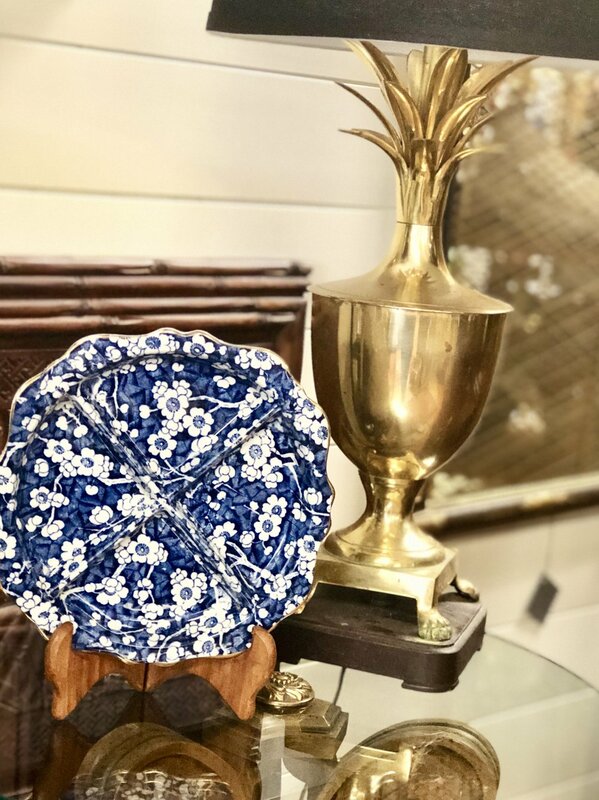 The deep blue of this divided plate pops against the sheen of the brass pineapple lamp. This royal lamp adds drama to any living room with the gilded Asian accents. 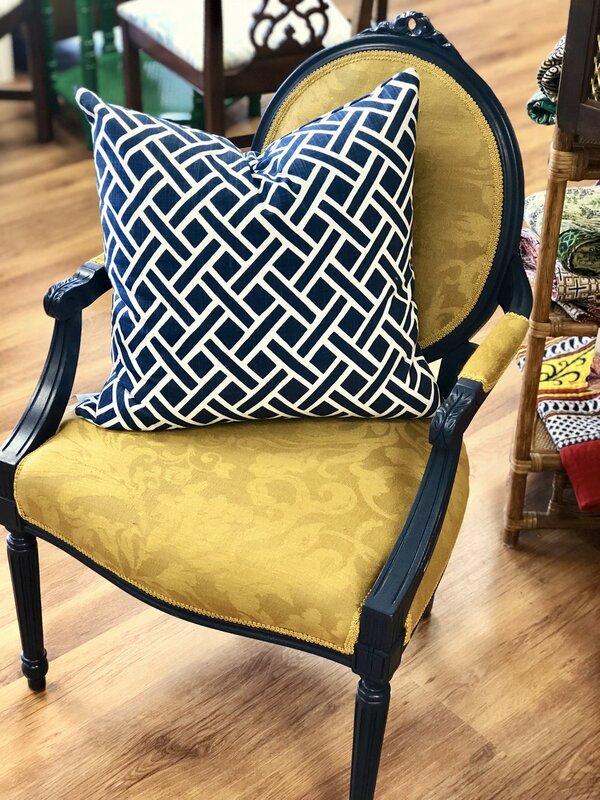 The photos above are only a select sample of the many ways Cottage Grove Vintage can assist you in furnishing your home with blue and gold. Come visit and allow us to help you find accessories that fit your style! 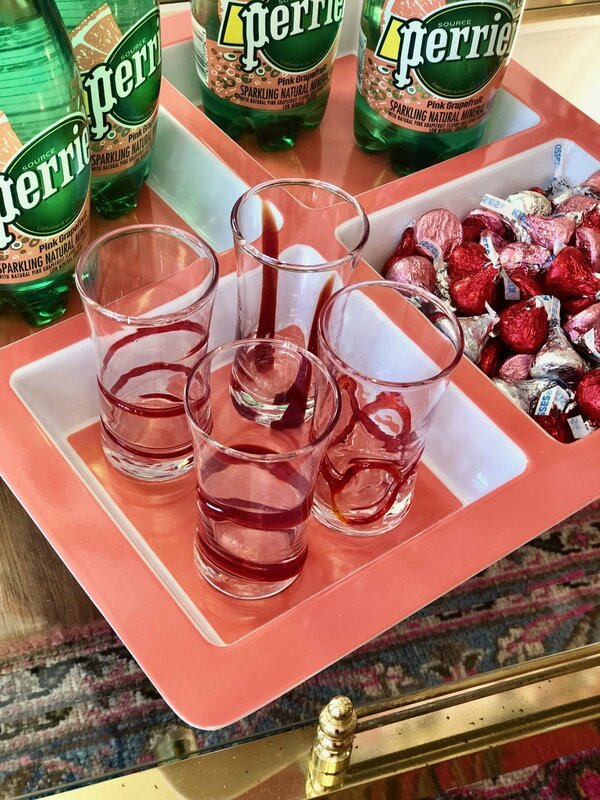 With Valentine’s Day happening in a few short days, we’re bringing you pink and red inspiration to add spice to your celebrations with a Valentine’s Bar Cart. The bright pink and red accessories pop against the sheen of the mint condition brass bar cart. The red and gold chinoiserie glasses are begging for cool ice from the crystal ice bucket and the bamboo stainless bar accessories make it easy to measure and mix concoctions. 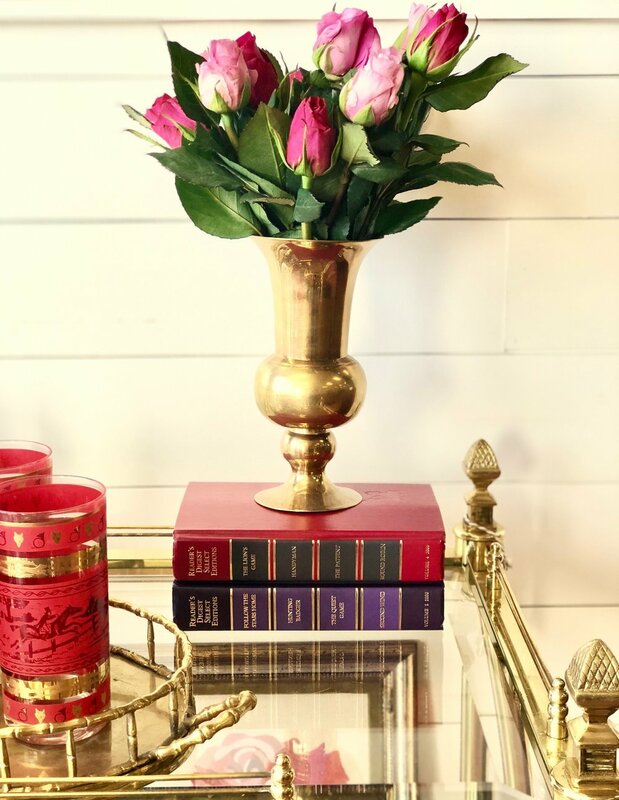 Having a gilded vase or small urn for flowers makes it convenient to display—as are books to create a pedestal for showing them off. The brass cricket box makes storing matches for the candles above easy and discreet. No bar cart is complete without crystal and glass decanters to offer a variety of drinks to guests. Roses in needlepoint last longer than roses from the florist; this framed piece can be utilized for many more cocktail parties! This work helps set the tone for Valentine’s. If roses aren’t your style, the shades of pink in this original magnolia artwork continue the theme of vivid bright shades. Use the crystal ice bucket to keep your rose wine perfectly chilled and why not continue the blush tones by pouring in miniature wine glasses in coordinating hues? Lush pomegranates in a brass bowl echo the color scheme without being too cheesy, but the heart shaped basket in the background subtly prompts to the special holiday. 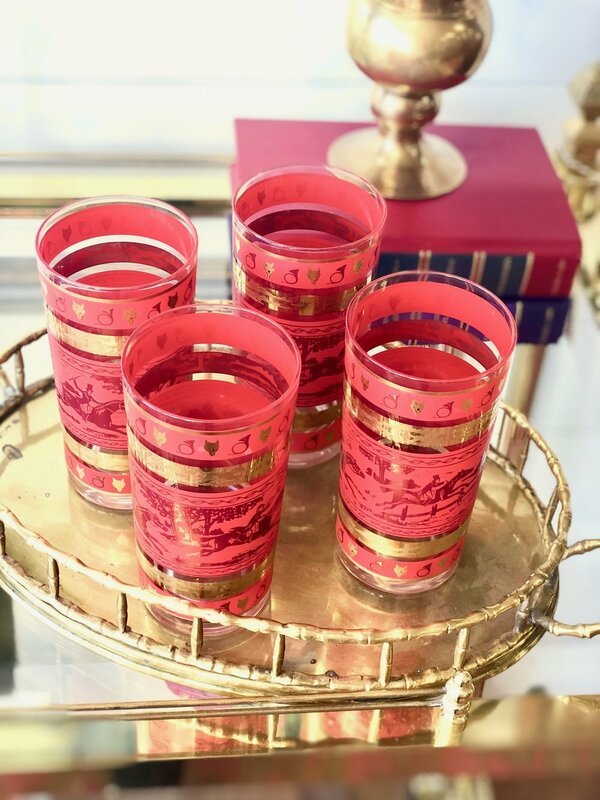 Shot glasses with a brushstroke of red continue the theme and can be used for many more celebrations with the same hue—Christmas, Fourth of July, Memorial Day, and more. 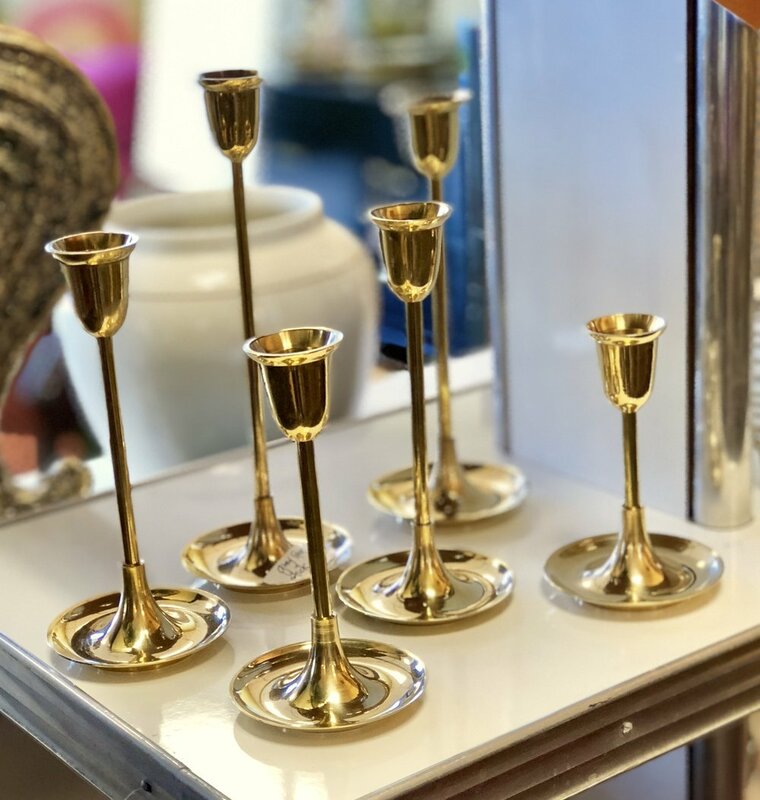 Brass candlesticks will help set the mood with candlelight, and ending the night with a kiss, chocolate or on the lips, is always sweet. Sugar cookies on a delicate heart-shaped dish are a delicious finishing touch. Below are the items we utilized to create the scenes above; we’ve linked them to the vendor’s Instagram. We look forward to seeing you in the store to shop these accessories and more to add a touch of the upcoming holiday to your home decor! Happy Valentine’s Day! Named as a top trend for 2017 by House Beautiful UK (among others! ), evergreen is showing up big time in interiors and fashion. We love mixing it with natural textures, crisp whites, and our ever-favorite brass finishes. Try mixing in lighter green touches or incorporating your favorite indoor plant to allow the different tones to play off one another. For continuous inspiration, be sure to follow us on Facebook and Instagram, and if you're giving evergreen some love in your space, share a photo with us! We love to see what our customers are up to.